The hottest new nappy bags to hit Australia from Total Bag Envy will have your friends convinced you’ve spent a fortune on your new gorgeous bag. We suggest smiling mysteriously and quickly changing the subject before those friends discover how affordable these lovelies really are! I’ve always loved designer baby bags but (like many other mums) not their price tags. The fabulous folk at Total Bag Envy have created gorgeous designer bags in seasonal colours that keep in vogue with the latest fashion without leaving a gaping hole in your pocket. 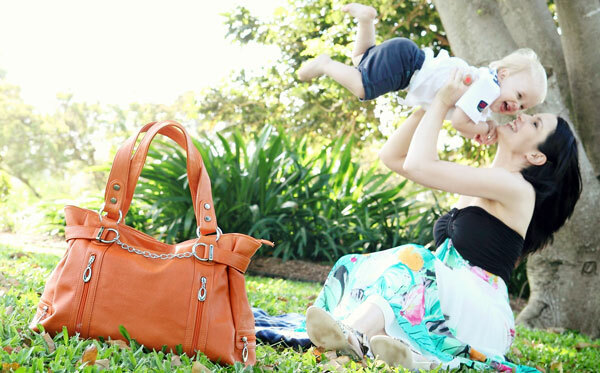 My favourite, the orange Total Lust nappy bag (priced $99.95) is perfect for summer and the current colour-blocking wardrobe trend. For winter the warmer hue of the berry red Total Envy nappy bag ($94.95) begs to be teamed with wardrobe staples of black and grey. Each bag has funky hardware details and a bounty of internal and external pockets, with the addition of a matching change mat and insulated bottle holder. Total Bag Envy also offer coordinating Total Indulgence wallets, normally priced at $49.95 but yours for a bargain $29.95 if purchased with a nappy bag from the Total Envy collection. See the whole collection (where each bag is under $100!) at Total Bag Envy.